WASHINGTON – If federal immigration officials cannot create more “humane” conditions when making enforcement raids against undocumented immigrants, then “these enforcement raids should be abandoned,” said Bishop John C. Wester of Salt Lake City, chairman of the U.S. bishops’ Committee on Migration. The raids, conducted by the Immigration and Customs Enforcement division of the Department of Homeland Security, “reveal, sadly, the failure of a seriously flawed immigration system,” Bishop Wester said at a Sept. 10 press conference at the bishops’ headquarters in Washington. Bishop Wester noted that after Congress’ failure to pass a comprehensive immigration bill last year, Homeland Security started conducting mass raids, mostly at workplaces. A May raid at the world’s largest kosher meatpacker, in Postville, Iowa, resulted in 389 arrests and criminal charges lodged against 305 workers. 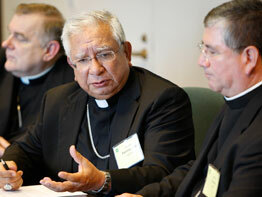 Bishop Ricardo Ramirez of Las Cruces, N.M., said at the press conference that Homeland Security had been conducting raids in Roswell, N.M., during the same week the U.S. bishops’ Administrative Committee was holding its Sept. 9-11 meeting. The Homeland Security immigration enforcement budget will grow from $9.7 billion in 2004 to $15 billion in 2009, according to Donald Kerwin, executive director of the Catholic Legal Immigration Network. “To date, he added, 338 miles of border fencing (have) has been erected, and thousands of additional Border Patrol agents are being added to the existing force of 17,000. The press conference by the bishops came one day after Bishop Wester said the U.S. Catholic Church would join an interfaith effort to change U.S. immigration law. To prepare for that effort in the next Congress, it also would join the Tour of the Faithful, an educational effort during September and October to convince people of faith to support changes in U.S. immigration policy. “We’re in a dark period,” said Bishop Wester during a Sept. 9 conference call to announce the 17-city Tour of the Faithful. “Our current national immigration policy … consists of work-site enforcement raids” that result in, among other things, “the dislocation of U.S. citizen children from their parents,” he added. “As a nation – a nation of immigrants, I might add – we cannot accept the labor of immigrants while undermining their basic human dignity,” Bishop Wester said.